"I find the headline accurate and supported by the article. The article explains the novelty and impact of the research accurately for the general readership and in particular the context provided from the scientists works really well in this regard." "The theory of sea-level rise and flood problems is pretty well understood — this makes the point that this theory is also happening now and can only be expected to get worse — sea levels have been rising on the US east coast for the last 150 years or more and even if current trends simply continue, impacts will continue to grow. As the article states, we actually expect a significant acceleration of sea-level rise in the coming decades meaning the impacts will grow more rapidly." "before propagating a marginal view, one should ensure having a very strong argumentation; in this interview no argumentation is put forward to support Peter Wadhams’ central claim. 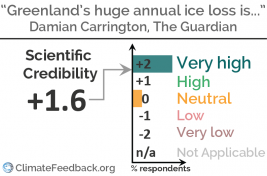 Wadhams' alarmism is potentially harmful, because when such spectacular predictions are not realized some people may perceive the whole scientific community or science itself as untrustworthy." 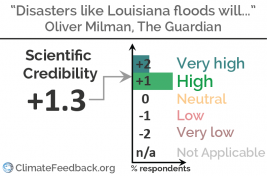 "this article does a good job reporting on the recent floods in Lousiana and, more generally, the climate-change-induced changes in the water cycle that underlie scientists' concerns about future increase in floods. However, "heavy rainfall" is not strictly synonymous to "flooding"..."
"This is a well-written article that provides a good overall discussion around the connection between climate change and the ongoing US heat wave. 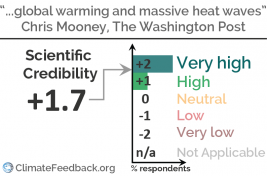 In the absence of a specific event attribution study the role of climate change in this event can't be quantified, but Chris Mooney provides an insightful overview of the role of climate change in heat events generally." "This article makes little sense. It uses scientific jargon, such as in the last paragraph, to make it sound "scientific", but uses it so loosely that it has no meaning. 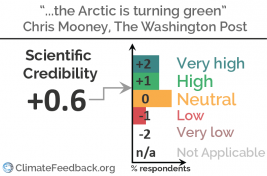 I do not see any logic behind these wild claims, there are no connections with established research, and there is no discussion of statistical certainty. 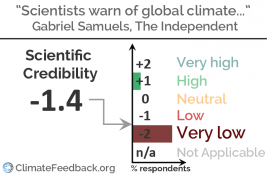 Moreover, wild attributions to anthropogenic climate change are made without any backing." "The article reports about recent evidence that terrestrial ecosystems are 'greening' in response to human activities, principally the increasing atmospheric CO2 concentration. The author presents this 'greening' as a new finding while annual global carbon budgets have reported that about 25% of the fossil-fuel emissions have been taken up by the biosphere since the 1960s. 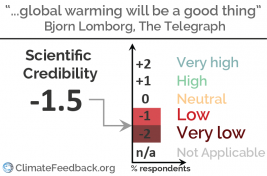 Nothing is fundamentally wrong in the article but it is organized in a somewhat misleading way"
"This article presents a highly biased view of global warming, only presenting the “positive” aspects of it. As the author is criticizing media doing the opposite (always showing the bad side of climate change) it is a shame the author didn’t present a balanced view here." 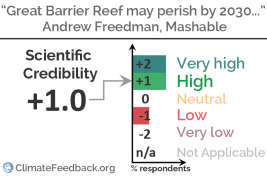 This Mashable article reports on new preliminary research that finds the ongoing coral bleaching event in the Pacific is mainly due to human-caused global warming, and that if global warming proceeds as currently expected, "large parts" of the Great Barrier Reef could die by the mid-2030s. 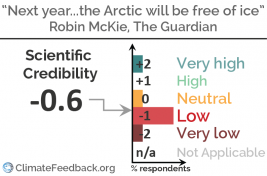 Six scientists have reviewed the article and conclude that it is overall accurate and in agreement with the science.